Coyote is the ruler of her world, she creates everything from rainbows to television commercials, but what she loves the most is to play ball. Coyote is always trying to find someone to play with her and does not like to loose. In her search for new players Coyote meets a funny looking red-haired man named Columbus and his crew of clowns, but they were not interested in playing ball, all they wanted to do was find a way to become rich. Suddenly, Coyote’s world changes when Columbus captures her human being friends and sells them in Spain to rich people. This is story that invites children to learn about Columbus’s voyages from a native point of view, it is full of colorful illustrations and entertainment. This story introduce from a native perspective, it reveals the real motives behind Columbus's journeys and the oppression that Native Americans suffered as a result. In this story Christopher Columbus is not portrayed as a hero who discovered America, but instead uncovers the atrocities that he committed against Native Americans, a society of friendly and peaceful people. 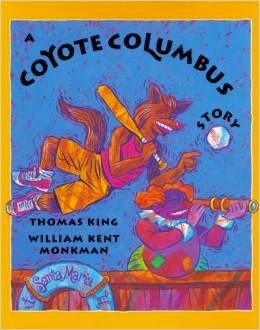 In this story Coyote who is the creator of her world is always looking for someone to play ball with her, when all the sudden she meets Columbus and his crew, who she describes as having bad manners and only wanting to look for gold and things to sell. When Coyote learns of Columbus's intention to sell the human beings in her world she laughed, thinking how silly and insane it will be for someone to sell or buy humans, which actually happened, linking to the history of injustice that Columbus committed against Native Americans. In the book Columbus was eager to become rich and sells Coyote's friends in Spain in order to get candy and a used Mercedes. This describes how greedy Columbus was and how he didn't see Native Americans as equal, but inferior. Instead of being grateful for their good hospitality Columbus and his crew oppresses their people and takes their lands. In the story we learned how Columbus's voyages changed Native American's lives forever and how he uses force and power to accomplish it. Children could work in groups of four and retell the story using fun illustrations on a construction paper. Once they are done they could share their story with the class and share their favorite part and least favorite part of the story, they will be able to share their understanding of events, ask questions, and obtain feedback. The projects should be displayed in the classroom once their presentation is done. In there journals or a piece of paper, they could also draw their favorite and least favorite character of the story and write down 5 reasons for their choice. The students could also replay the story and come up with a different ending to the story.